Do you need to thank a football coach for the time spent coaching the team? 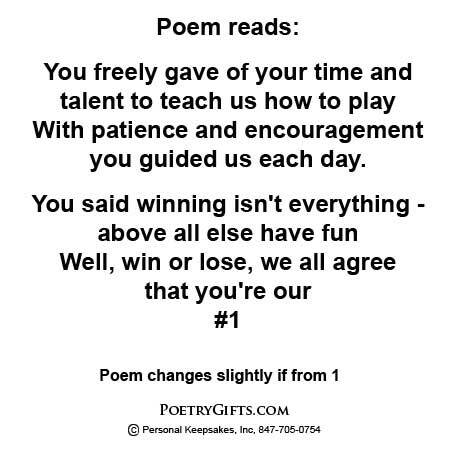 This thank you poem is a great way to show appreciation. Personalize it with names, optional date, and a personal message from the team or child. When the coach displays this football frame on a desk or table, it will be a constant reminder to him or her that the kids think he or she is #1...There's no better gift than that! Also makes a great personalized coach birthday present. It's the end of another sports season, and parents begin asking the question: What gift can we buy for our child's football coach? 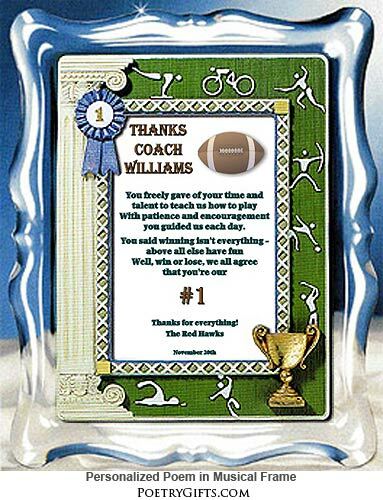 Why not give the coach the gift of knowing the team members think he is THE #1 COACH!. This Poetry Gift says it beautifully. The coach will be touched that parents and kids thought enough of him or her to take the time to create a personalized gift just for them. This Poetry Gift can be purchased with or without a music box mechanism on the back of the frame. Acrylic frame with sport decals - outside frame dimensions 7" x 9"